In 1992 the Golden Spike Chapter of the Railway & Locomotive Historical Society has taken on the effort of restoring, Denver & Rio Grande Western railroad steam locomotive #223 to an operational engine. The current effort is the completion of a new tender tank. Although the pace of the project is slow, we have made considerable progress considering the number of volunteers working on the project and the available funding. Simply stated, we would be further along if we had more volunteers and working capital (donations). But over the years we have built up the necessary shops and completed quite a bit of the restoration work. A very small crew of volunteers has done what has been done so far. We still meet most Saturday mornings in our shops on the North/West corner of the Ogden Union Station, 25th & Wall, Ogden, Utah, with access from trackside. What we need is more volunteers willing to work on the project and who will take responsibility for specific tasks. This is a commitment many find hard to make. With the small number of volunteers we have at this time, we can only work on one effort at a time. Also, with the rebuilding of the second air compressor and the tender tank our operating funds will hit a very low level. If you would like to contribute to this project, join our group of volunteers, or just learn more about railroading and restoration, please contact our project coordinator. You are welcome to make direct donations to the 223 Restoration or other projects we are working on at PayPal. Click on the donate button below. A short video on DVD has been produced by a local Eagle Scout as part of his Scout project. He has become very interested in our 223 project and has been coming down to our shop at the Union Station for several months conducting interviews and recording some of our restoration activities. 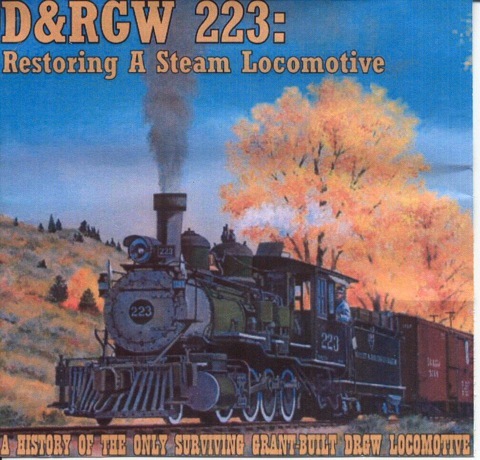 This DVD provides the viewer with an overall picture of the restoration project and comes with a companion CD with some pdf files on the history of the 223 all for a fee of $5 plus shipping. The proceeds will go towards the 223 restoration work. Those interested in obtaining a video can send an email to Lee Witten at lewitten1@comcast.net.